As a parent, you know that one of the most important contributors to your child’s oral health is visiting your children’s dentist in Hillsboro for preventive care, but since this will be the first appointment, you’re worried about how he or she will react. 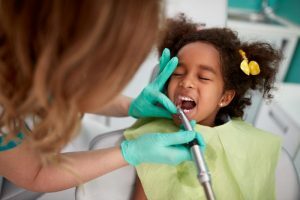 You wonder, “What can I do to make this a smooth transition?” Thankfully, there are some simple things you can put in place that will accommodate your wishes and start your child down a path to excellent oral health. Read on to learn some strategies. To help break the ice, you can take your child on a tour of the dentist’s office before an official appointment. While there, he or she can meet all the staff members and walk around the facility to get acquainted. They can also watch Dr. Royse in action and see the smiles on the faces of the children he’s providing care for, so they’ll feel more comfortable about receiving the same. Children are like sponges and not only listen to what adults say but also monitor body language. Thus, it’s important to not show any signs of worry or uncertainty because that will make your child more apprehensive about the visit. The morning is a better time for the visit because your child will be less likely to be tired and irritable. It’s also a good idea to feed him or her with a light breakfast, which usually helps children be more attentive and relaxed. Leading up to the dentist visit, you can keep reminding your child in a fun way, infusing the same type of excitement that would be present for an upcoming birthday or holiday celebration. In actuality, this really is an exciting opportunity because it’s a way to prevent a host of oral health problems by starting this new trend of visiting the pediatric dentist in Hillsboro regularly. One of the goals is to create a habit that carries over into adulthood. Watching your child grow-up is a priceless experience. With the help of Dr. Royse and the staff at Dentists at Orenco for Kids, you can rest assured that he or she will have healthy teeth and gums along the way! Dr. Michael Royse earned his dental degree from the Oregon Health Sciences University School of Dentistry. He would later go on to graduate from the Fort George G. Meade DENTAC Pediatric Dentistry Residency. A board-certified Diplomate of the American Board of Pediatric Dentistry, Dr. Royse maintains membership in several professional organizations. He helps children enjoy excellent oral health at Dentists at Orenco for Kids, and he can be reached for more information through his website.